Viroid seed transmission data are important for plant production because such information can be very helpful in preventing the movement of viroids worldwide via infected seed. 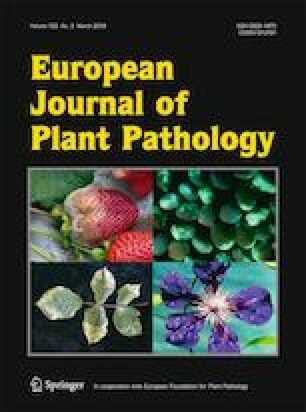 In this study, the reverse transcription-polymerase chain reaction (RT-PCR) technique was used with columnea latent viroid (CLVd) specific primers to investigate viroid seed transmission from three infected eggplant (Solanum melongena L.) genotypes through cross-pollination to seeds and seedlings. Pollen was harvested from CLVd-infected eggplant plants and used to cross-pollinate healthy plants (recipient parents) to produce seeds for the CLVd seed transmission test. CLVd that was localized on the seed coat and in the seedlings was determined using a ‘top-of-paper’ germination technique. The RT-PCR results showed positive results, indicating that CLVd was located in both the seed coat and the seedling. The RT-PCR test performed on 8 week-old seedlings of ‘Farmers Long’, ‘Jamaica’ and ‘RPG’ showed that the seed transmission rates were 82%, 6.4% and 2.3%, respectively. Based on this work, CLVd seed transmission was confirmed in eggplant. Furthermore, these results indicated that CLVd-infected pollen carries the risk of transmitting the viroid, during cross-pollination, from a donor eggplant to its progeny. This work was partially supported by: the Center for Advanced Studies for Agriculture and Food, Institute for Advanced Studies, Kasetsart University Under the Higher Education Research Promotion and National Research University Project of Thailand, Office of the Higher Education Commission, Ministry of Education, Thailand; the Center of Excellence on Agricultural Biotechnology, Science and Technology Postgraduate Education and Research Development Office, Office of Higher Education Commission, Ministry of Education (AG-BIO/PERDO-CHE); the Agricultural Research Development Agency (Public Organization); the National Research Council of Thailand (NRCT); the Kasetsart University Research and Development Institute (KURDI); and the Department of Plant Pathology, Kasetsart University, Kamphaeng Saen campus, Thailand.